Video game voice and stunt performers have announced an official strike. SAG-AFTRA, the joint labor union for screen, TV and radio, is striking game companies. The strike begins today. SAG-AFTRA offered that it comes "after nearly two years of unsuccessful negotiations." The dispute is happening over pay, lack of transparency and age of original contract. The first contract was constructed in 1994. SAG-AFTRA also announced that "members will picket Electronic Arts in Playa Vista, CA at 10:30 a.m. PT, Monday, Oct. 24." 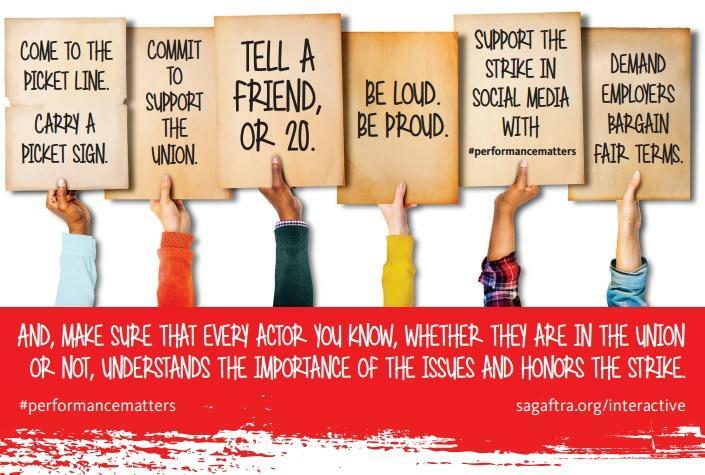 SAG-AFTRA represents around 160,000 artists. Not all of them work in games; but, a lot of the top game vocal talent belongs to SAG-AFTRA. Union members must stop working on games that entered production after Feb. 17, 2015. Thanks to the secrecy of game development, we can't be sure which titles this affects. The publishers, though, make huge games. The list above makes Red Dead Redemption, Grand Theft Auto, Call of Duty, Mass Effect, Overwatch and a whole lot more. I know you read that opening bit about voice and stunt performers and questioned the latter group. Games today need stunt work thanks to motion-capture. Remember the TV strike? In 2007 and 2008, the Writers Guild of America went on strike. TV as we knew it broke down. Without performers, games are in serious trouble. If and when the strike is settled, we'll have the news.